This hunting scene shows how two horses and their riders overcome a ditch in which they have landed and have to climb out of the water. A situation which belongs to the practice of hunting after hounds. These riders carry a hunting horn and direct their horses with only one hand. This is a French hunting scene, which is less well known than British sporting art. 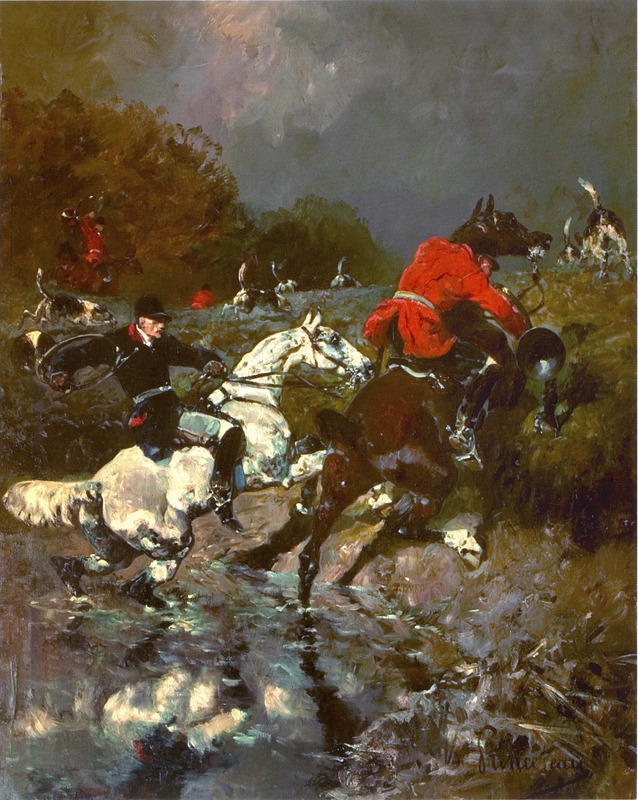 Hunting after hounds, however, has in France a similar tradition as in Britain, lasting until the present time. The artist René Princeteau (1843-1914) may be less well known than his British contempories like Joseph Crawhall, Lynwood Palmer or Alfred Munnings, but the way he rendered horses in the hunting field and in other activities was not less captivating. He participated in hunts out of Chantilly, on the invitation of the Duc d’Aumale, and used his own experiences in his paintings. Moreover his style was very original. He was the teacher of an artist, who became world-famous, Henri de Toulouse-Lautrec (1864-1901). In the horses of Toulouse-Lautrec one immediately recognizes the style of Princeteau, but very few paintings by Princeteau can be found in museums. The Musée des Beaux-Arts in Libourne (Gironde, France), however, is completely devoted to his work.